Just thought I'd wish you a happy Easter and may the bunny be good to you... mmm chocolate. Thats ahhhh...thats alot of chocolate. All hail the Easter Platypus! I hope everyone has a nice Easter. Me, personally? My least favorite holiday. Less candy then Halloween, long and formal, no interisting TV programs or movies, and I think Easter ham is nasty. Its all wet and mushy and has mustard and sugar plus pineapples on the outside. Ewwwwww. I did paint nice little Boba Fett egg though. I'll take a picture of it before it gets obliterated into deviled egg tomarrow. Oh, btw? If you guys see a floor display of eggs and then right behind that are the EXACT SAME eggs....PLEASE PLEASE PLEASE PLEASE PLEASE *gets on knees begging* take from the boxes on the floor!!!!! Having to bend down, take eggs from the box, and put them on the shelf, in a constant leaning over state, is 99% of why I have this back pain. (I almost threw up and later almost fainted, that's how bad it got one day) I hope everyone who took from the shelf breaks their back so they know I feel. I even TOLD some people that it's so much easier for me if you took from the box, I made my point to so many people, and yet they watch me fill the shelf from the floor and then watched me rub my back with a look of extreme pain on my face.... and then take from the shelf. And no one will believe me when I say these people are evil. I got a Maltesers one from my neighbour, Mabel. She's 92 years old! Also, Val, I think that egg is made from shiny brown marble, not chocolate. It is very pretty though! A belated happy Easter everybody! Not much happened for me yesterday. Dad and I went out for lunch that was it. but mine was good. 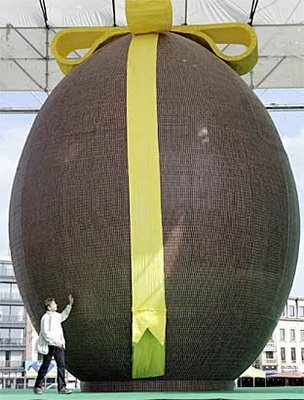 I only got a few easter eggs. But I'm not fussed over Easter. Sure, it's a holiday, but still, it's not christmas or a birthday. I've still got most of my candy (I'm really good at making it last for some reason. I can even make Halloween candy last to Thanksgiving). All the chocolate is melting though. D= Only in Arizona does chocolate melt in April (it can melt in February too, actually). Is chocolate classed as " candy " over in the USA there? I thought " candy " was just another names for sweets... hmm. Chocolate is candy. Sweets and candy are basically the same thing. Over there aren't a lot of sweets made from chocolate? Over here almost every kind of candy has chocolate in it. unless there's haribo stuck inside Cadbury Dairy Milk bars!!!!!!! You don't know of chocolate and peanut butter?? So you mean you don't know what Reeses is? Reeses are the best, they're my absolute favorite. I know what Cadbury is, we sell them here too. They're more expensive though. Hershey's is what I eat mostly, it's another chocolate company. I'm with Miba. Reeses is definitley the best. That's my Kryptonite, I think. I used to love it when Easter came around, because they made those special Reeses Peanut Butter Eggs. But now they also have the Reeses pumpkins for Halloween and the Reeses trees for Christmas. They taste so much better than the regular Reeses cups, I think, because they're big enough to put more peanut butter in them. "Hey, you got your peanut butter all over my chocolate.....Hey, you got your chocolate all over my peanut butter." And you know that the Fettster has been a Reeses man since the 80's. Oh, and that is the BEST Reese's wrapper ever.